Featuring creamy pumpkin and hearty oats together with a comforting blend of chai spices, this quick and easy vegan breakfast recipe is inspired by the flavours of autumn. Hi Everyone! A few days back, we experienced a cooler day after an overnight rainfall. It was a nice break from the hot (and often uncomfortable) days of summer. There were grey clouds in the sky, a cool light breeze, a noticeable drop in temperature, and I actually put on a light jacket during the day to go outside. It felt like it was Autumn. Did I mention that Fall is my favourite season? Leaves changing colours (so beautiful), wearing cozy sweaters (cozy everything), Halloween (I’m way too old to trick or treat, but I do like some discount chocolate), and Thanksgiving (so much delicious food). It’s also the season for all things pumpkin. I’m getting so excited. 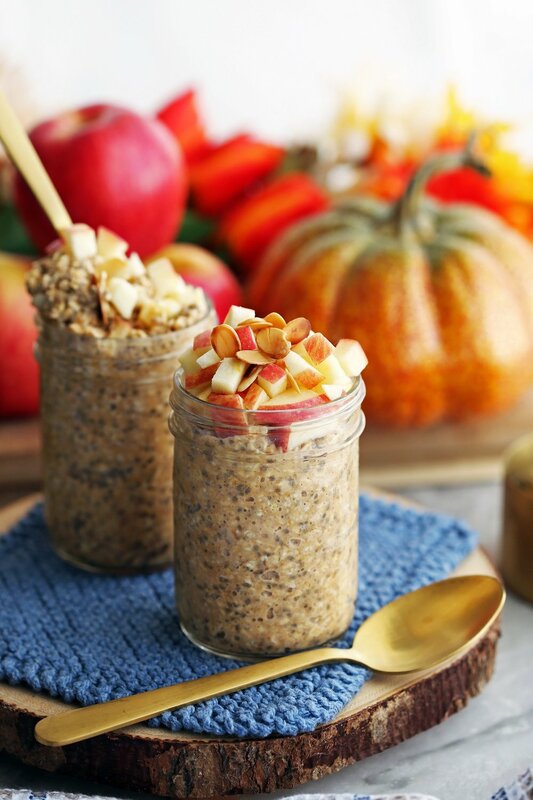 As a result, I was inspired to make super easy Chai-Spiced Pumpkin Overnight Oats! All the ingredients (minus optional toppings) for this delicious recipe. Full ingredient amounts and complete instructions listed down below in the recipe card. All the ingredients combined together. So simple to make. Place it in mason jars, seal with lids, and then store in the fridge overnight. 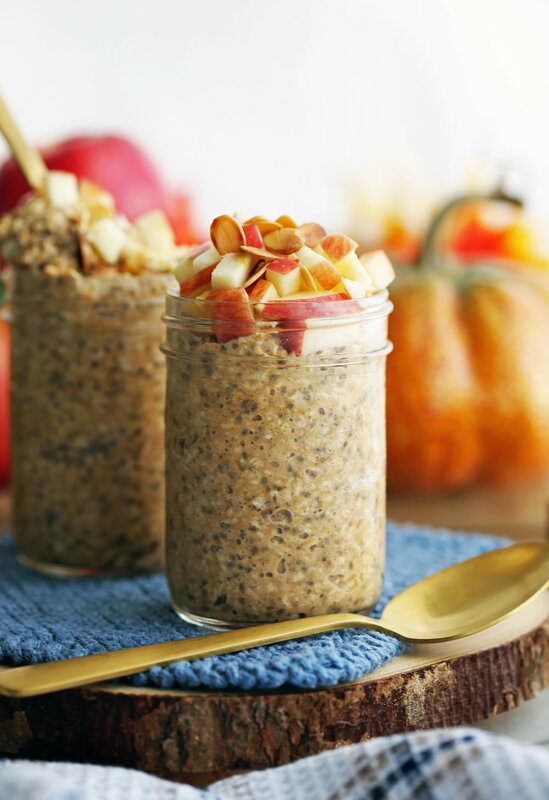 These tasty overnight oats are perfect for fall (and winter time)! It has lovely warming spices and a thick and creamy texture that’s so satisfying to eat. It is truly a delicious and simple make-ahead breakfast or afternoon snack that takes eight minutes (or less) to put together! Perfect for whipping up the night before, especially since it's a no-bake recipe, and enjoying the next day. It’s great for eating on busy mornings. This recipe is also vegan. A great option for those with dietary restrictions or for those looking to eat fewer animal products. What’s in these overnight oats? Oats: The most important ingredient. It’s fiber-rich, low in fat, and a source of protein, iron, and calcium too. I used quick oats (aka instant oats). These oats get really tender overnight and produce a creamier texture than old-fashioned rolled oats. I personally like this texture, but if you prefer a chewier texture that holds together better, go with old fashioned rolled oats (it’s also the usual overnight oats recipe choice). I would stay away from using steel-cut oats as they will likely be a little too firm even after soaking overnight in milk. Pumpkin puree: Gotta have pumpkin during fall time. I used canned 100% pumpkin puree for convenience. Look for ones that are free from preservatives and artificial flavours. Also, it’s different from pumpkin pie filling, which is already sweetened and spiced. I like to get pumpkin puree so I can control the amount of sweetness and spice when using it. Chai Spices: Warming, slightly sweet and spicy notes in this spice mix featuring ground cinnamon, ginger, cardamom, allspice, and black pepper is so comforting. A great contrast to the cold oats, but still cozy to have during the colder months. Chia seeds: This ingredient is optional, although I really recommend using it in this recipe. Chia seeds take on a thick tapioca-like texture when soaked in liquid, helping this tasty breakfast treat get even more hearty and silkier in texture. Plus, these little black chia seeds are high in protein, rich in omega-3 fatty acids, and full of vitamins and minerals. If you want, check out my recipe for Turmeric Milk Chia Pudding! Unsweetened vanilla almond milk: I used this dairy-free milk alternative, but feel free to use whatever milk you prefer. Maple syrup: You get to control the amount of maple syrup you want (if any) in your overnight oats so you get the right amount of sweetness. Additional toppings: I like to finish these overnight oats with diced sweet apple and toasted almond slivers. It would also be awesome with other fresh or dried fruit, other nuts, and roasted pumpkin seeds. Looking for more recipes using pumpkin puree? Vegan. Can be gluten-free too if you make sure you get gluten-free oats. I hope you give this recipe a try! If you do, please leave me a rating and comment down below or tag me on any of my social media. I’m @yay_for_food on Instagram. I’ll love a picture! In a medium bowl, whisk together the ingredients (except optional toppings) until it is well-combined. Carefully spoon into two (half pint) mason jars (or airtight containers). Seal the jars with lids and place in the refrigerator for at least 6 hours or overnight. After the oats are ready, open the jars and give the oats a stir and taste. Add additional milk if you prefer a thinner consistency and/or maple syrup if you prefer more sweetness. Finish by adding toppings of your choice such as diced apple or toasted almond slivers. Enjoy! I used quick oats (aka instant oats). These oats get really tender overnight and produces a creamier texture than old-fashioned rolled oats. I personally like this texture, but if you prefer a chewier texture that holds together better (it’s also the usual overnight oats choice), go with old fashioned rolled oats.